UPDATE at 7:35 PM | THE Bureau of Meteorology has cancelled its severe thunderstorm warning for southeast Queensland, advising the immediate threat has passed. 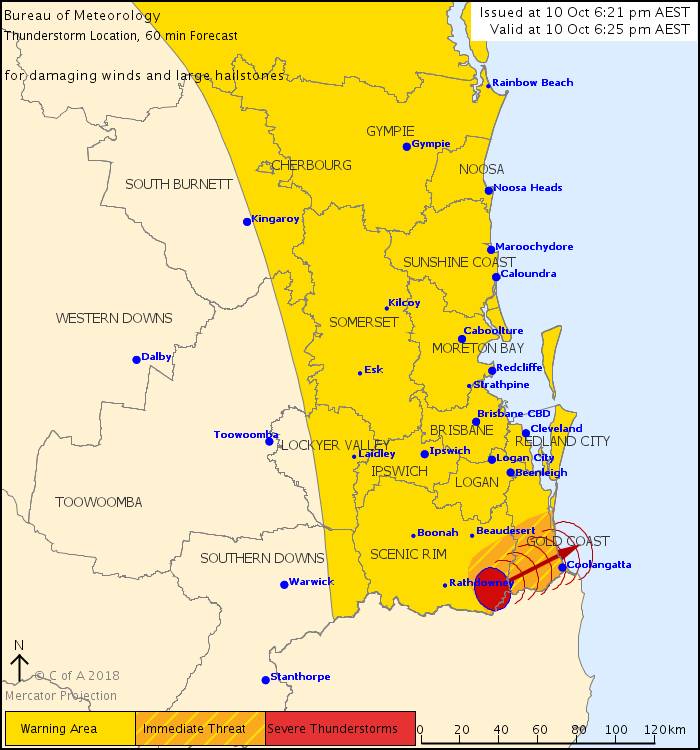 The bureau issued a detailed warning for the Gold Coast at 6:21pm, warning severe storms capable of producing damaging winds and large hailstones were likely to affect parts of the city within the hour. 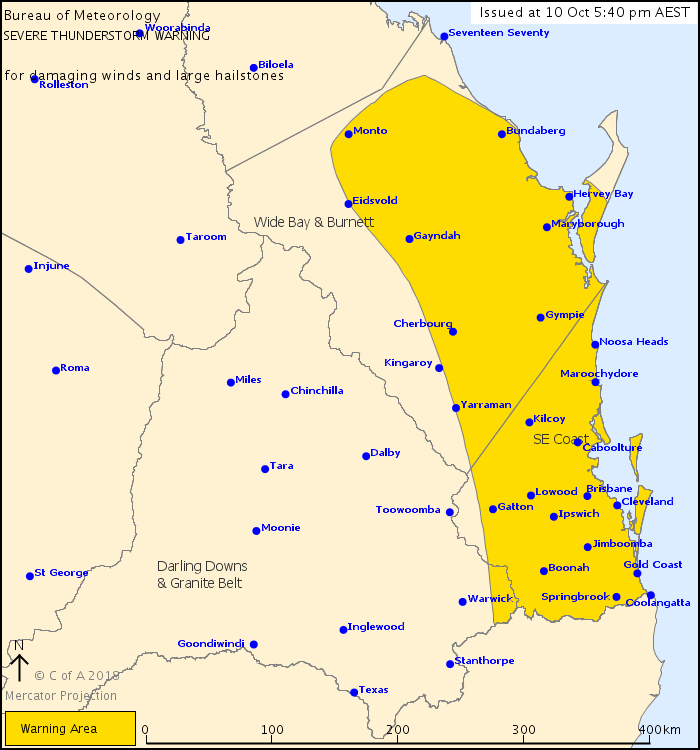 They were forecast to hit Tallebudgera and Mudgeeraba by 6:55pm, and Coolangatta, Miami and Southport by 7:25pm. Lightning lit up the sky as the cells marched toward Mudgeeraba. They slammed into the leafy suburb just after 6.30pm before going on to drench southern suburbs, skimming just south of Southport. Fortunately, no damaging wind gusts or large hailstones were reported. “While thunderstorms are continuing in parts of Queensland, the immediate threat has passed,” the weather bureau said when cancelling the warning at 7.22pm. Thunderstorms were still developing around the southeast, including near Nerang, Mount Tamborine and Canungra, at the time of writing as a southerly change made its way up the coast. UPDATE 6:20 PM | THE Bureau of Meteorology warns severe storms are likely to hit the Gold Coast within the hour. In its latest warning, issued at 6:21pm, the weather bureau warned severe storms were detected on radar near the McPherson Range and the area south of Canungra. These storms are moving toward the northeast and are forecast to affect Little Nerang Dam, Tallebudgera and Mudgeeraba by 6:55 pm and Coolangatta, Miami and Southport by 7:25 pm. Damaging winds and large hailstones are likely. UPDATE at 5:40 PM | THE Bureau of Meteorology has updated its generalised thunderstorm warning to include the Gold Coast as storms intensify on their approach towards the city. A line of storms has developed about 60km west of the Gold Coast and is fast moving toward the Coast. The weather bureau says these storms are likely to intensify and produce damaging winds and large hailstones in the warning area over the next several hours. Locations which may be affected include the Gold Coast, Brisbane, Maroochydore, Gympie, Bundaberg, Caboolture and Ipswich. UPDATE at 3:30 PM | THE Bureau of Meteorology has issued a generalised severe thunderstorm warning for southeast Queensland as storms begin building out west. The warning, issued at 3:30pm, warns severe thunderstorms are likely to produce damaging winds and large hailstones in the warning area over the next several hours. The weather bureau says this afternoon’s storms are expected to intensify as they move toward the coast. At this stage, locations which may be affected include Gympie, Ipswich, Gatton, Cherbourg, Beaudesert, Gin Gin, Jimboomba, Kilcoy, Laidley, Lowood, Mount Tamborine and Nanango. Further detailed warnings will be issued for any severe storms that do develop. FIRST at 7:00 AM | We’re still in Spring but the Gold Coast is expected to experience summer-like weather conditions today, with temperatures tipped to reach 30 degrees before a sudden change will see gusty storms lash the city. 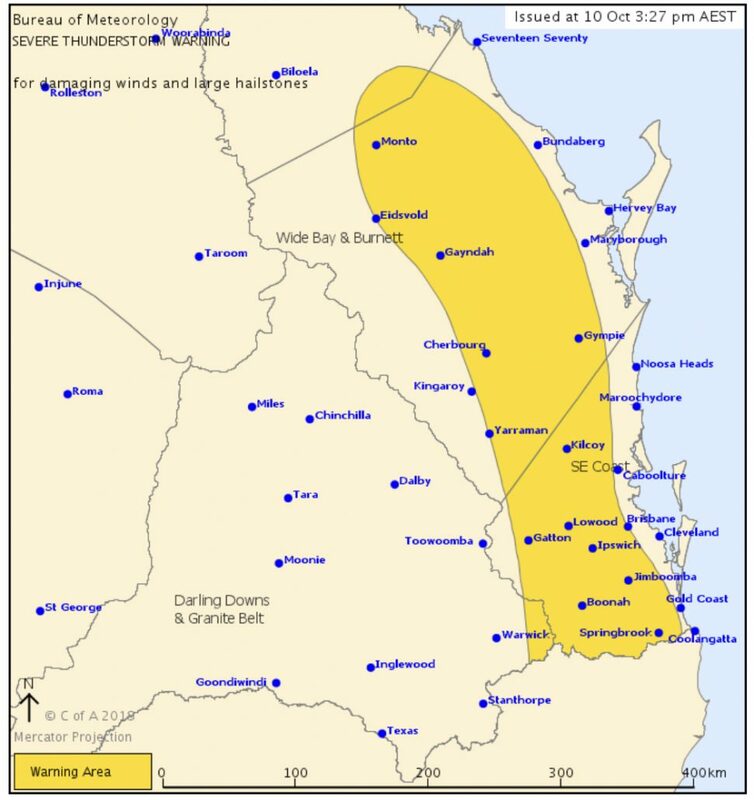 The Bureau of Meteorology has warned that possible severe thunderstorms could be on their way to South East Queensland this afternoon, with residents being urged to be prepared for the wild weather. “It’s a very unstable atmosphere at the moment, and we also have a southerly change coming north along the coast, so the combination of those is really going to focus the weather over SE Qld today,” Meteorologist Gordon Banks told myGC. Mr Banks said the storms are expected to be severe, with the potential for damaging winds, large hail and heavy rainfall which could cause some flash flooding. Much of the Gold Coast will swelter through scorching temperatures this morning however, with Surfers Paradise, Coomera, Nerang and Robina all tipped to reach 30 degrees and more. We’ll then see a sudden drop in temperature from Thursday, with showers expected to remain around until the weekend. “It will be really overcast and drizzly throughout the rest of the week and on Saturday,” The Bureau says.